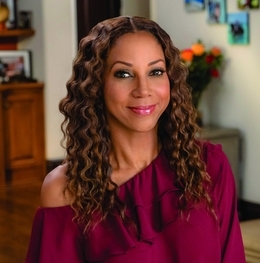 ACTRESS HOLLY ROBINSON PEETE HAS TAKEN ON A CADRE OF ROLES THROUGH THE YEARS, though some of the most important ones have nothing to do with her screen work. As a daughter, wife and mother, as well as an autism advocate, she has held fast to a singular motto: no risk, no reward. Today, the 53-year-old Mount Airy native runs a loving and chaotic Los Angeles household with her husband of 23 years, former Eagles quarterback Rodney Peete. Her family is at the center of Meet the Peetes, a heart-warming reality series currently in its first season on the Hallmark Channel. The show, which has already been renewed for a second season, airs Sundays at 10 p.m. Recently, Peete starred in the Morning Show Mystery, a movie franchise on Hallmark Movies & Mysteries. The first installment premiered in January, and she will head to Vancouver, B.C., this summer to make a second mystery movie. Such a harried schedule might exhaust a lesser human, yet the outspoken mother of four—there’s Ryan Elizabeth, a daughter in college; Rodney Jr., or RJ, who is Ryan’s twin brother; and two younger sons, Robinson and Roman—is energized. Peete has been in high gear for the past 17 years, when RJ, now 20, was diagnosed with autism, and she hasn’t slowed down since. In fact, she is preparing for a major fundraising event in July to support her HollyRod Foundation (HollyRod.org), which raises money and awareness for Parkinson’s disease (in memory of her late father) and autism (in honor of RJ). As the daughter of Matt Robinson, who played Gordon on Sesame Street, Peete made her first television appearance in 1969, playing a little girl named Sally on the inaugural episode of the ground-breaking show. After graduating from high school, Peete entered Sarah Lawrence College in New York, where she majored in psychology and French. She studied abroad for a year at the Sorbonne; she’s fluent in French. While there she sang in Paris nightclubs, including a memorable performance with jazz legend Lionel Hampton at Le Méridien Etoile’s Jazz Club. With the help of her devoted mother and talent agent, Dolores, now 82, Peete landed TV and film roles, including 21 Jump Street, Hangin’ with Mr. Cooper, For Your Love and Like Family. We recently chatted with Peete about her family, autism advocacy and Meet the Peetes, all of which keep her fired up and ready to take risks. Tell me about your Philadelphia roots. They run very, very deep. My dad was on Sesame Street, but before those days, he was an on-camera personality at WCAU. My mom worked at KYW. It was always “Philly or bust” with my parents. Rodney played for the Eagles for years, and we still have a lot of family there. I have lived in California a long time, but I still bleed Eagles green. My mom gave me the best advice: Never allow anyone else to dictate my mood or to define my happiness. Has your vision for Meet the Peetes changed since you first envisioned it? Initially, we envisioned a family show that people could connect with and watch together. I liked tweaking the genre to being more positive, because when you think about [reality TV], you think of wineglasses being thrown across the room. The show is very resolution-driven and not conflict-driven. We’re a typical, fun family who does fun things together, and we’re not perfect. The humor and the heart were always the keys. We make you laugh and tug at your heart. Why did you want to share your son RJ’s story on Meet the Peetes? Most of all, I wanted to show the success that RJ has had. When he was young we were told he was never going to speak. We were told he was never going to have friends, hold down a job or drive—all things that typical boys can do—and this was devastating to hear that when he was only three. It was crazy and it caused stress in all of our lives. What have been the most rewarding and challenging parts of being a mom? The best part is when they’re genuinely happy, and you’re only as happy as your least happy child. The most challenging part for me is letting them make their own mistakes. What life lessons do you want to teach your children? I want them to have the tools to navigate disappointments, and process challenging moments. I like to say, “Count your rainbows, not your thunderstorms.” I want them to come from a space of gratitude and look for the silver lining. … It’s OK to cry. It’s OK to be disappointed and upset, but you can’t live there. You have to just stay focused on the gratitude. Being able to create work that I am proud of, and that one day my grandchildren will be able to watch. I want my family to be safe and happy. Really, what more could a mother want?